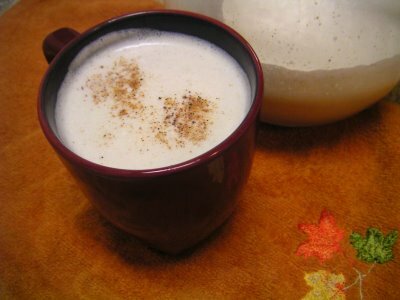 Eric and I love eggnog. In fact it is the first thing we’ve made in the kitchen together. Back when we were first engaged we made some to bring to a Halloween party. For us it symbolizes the start of the holiday season. I’m posting the original recipe by Alton Brown. But we did make some changes. First of all, the recipe contains alcohol, but is just as delicious alcohol free. Secondly, we used 2% milk instead of whole because we didn’t have any whole on hand. This did make it a little thinner. 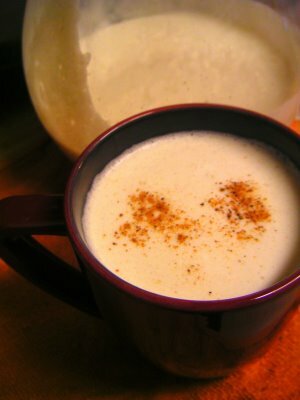 one of my favorite holiday memories was my mother’s eggnog, this takes me back. That’s so sweet Jen. I love it when something triggers a special memory.